When the sun goes down each day during the holiday season, San Antonio lights up with thousands of twinkling lights. If you're going to be in the San Antonio area during December, here's where you can partake in the festivities, Texas-style. 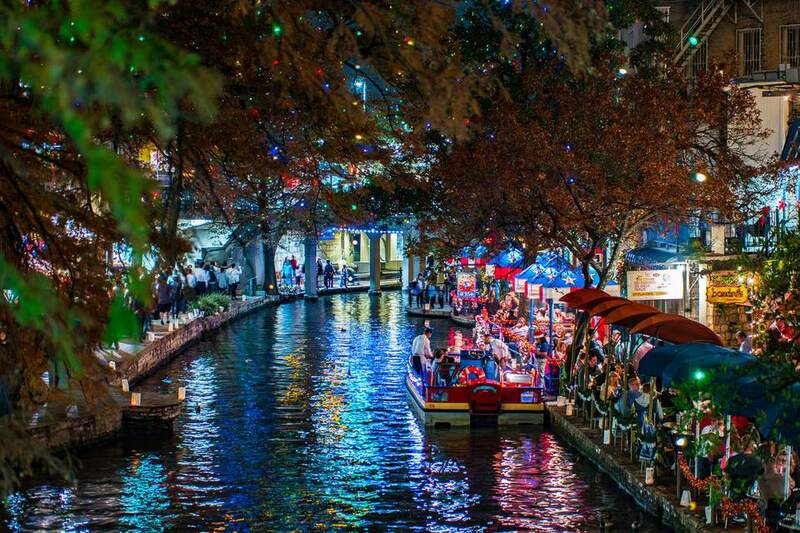 Every year, thousands of lights are turned on to light the renowned San Antonio River Walk on the day after Thanksgiving, which is November 23, 2018. On that day, the Ford Holiday River Parade is held on the River Walk, and only those with a ticket will have access to the River Walk. But starting November 24 and continuing until January 6, 2019, everyone can take a look at the River Walk's 100,000 holiday lights for free. The lights will be on from 5:30 p.m. to 6:30 a.m. every night, dusk to dawn. The River Walk is open 24/7. The University of the Incarnate Word starts off the holiday season with a lighting ceremony and entertainment at 6:30 p.m. on November 17, 2018. The lights will stay on at the university every night until January 6, 2019. At the lighting ceremony, you can get snacks and drinks from food trucks and visit the Holiday Shoppe to check out the wares. There will also be fireworks, live entertainment, and concerts to kick off the lighting ceremony. The Christmas Light Fest at the Old Wild West-style Enchanted Springs Ranch (35 miles northwest of San Antonio) boasts that it is the most dazzling holiday light show in the San Antonio area. You can walk through miles of holiday light tunnels on select dates from Thanksgiving to December 16 and every night between 6-10 p.m. on December 20-30, 2018. Stop into Santa's Village, a rustic barn filled with holiday goodies and, yes, see Santa Claus while you're there. If you prefer a more low-key experience, you might like the Ford Fiesta de las Luminarias, which takes place on the River Walk over three weekends in December: November 30 through December 2; December 7-9; and December 14-16. The 2,000 luminarias (traditional Mexican Christmas lanterns) will be lit starting at dusk on these nights, and you can enjoy them while having dinner at one of the River Walk's many restaurants. SeaWorld San Antonio sparkles with 9 million lights in what it dubs the biggest holiday lights display in Texas. The show is on from November 17, 2018, through January 6, 2019. Besides millions of lights in this unusual winter wonderland, you'll get a glimpse of Rudolph the Red-Nosed Reindeer and get to chat with Santa. At ZooLights at the San Antonio Zoo, you can do a regular zoo stroll, holiday style, under bright Christmas lights strung throughout the zoo. But there's more: You can get hot chocolate and roast marshmallows on your visit and watch the Lakeside Light Show, take a ride on a camel, or go ice skating. Santa will be there if you want to remind him what's on your list. ZooLights opens on November 17 and runs through December 31, 2018. Hours are noon to 9 p.m. every day except for Saturdays, when ZooLights will be open from 10 a.m. to 9 p.m.